WordPress is running over 17% of the Internet nowadays (and that number keeps growing). It’s being listed as a job skill on job boards. It’s what the technical and non-technical alike are using to build websites. Simple date-based blogs to full-fledged e-commerce solutions and news agency sites are being built with this same core functionality. So it’s time we learned about this open source software, and time to learn where we can do that learning! The great thing is that some sources for learning WordPress are free! Better quality, more structured training may come at a small price, but when you think of how well you’d be able to sell yourself on the job market after learning WordPress professionally, they are totally worth the pocket change. Another great thing is that different resources can apply to different learning levels. Whether you want to learn WordPress from scratch, or learn the latest techniques to grow your development skills with WordPress, the Internet is a great place to do that. Here is our list of 11 online places to learn WordPress! Animated book covers of Lovecraft Middle School series. These designs are by far the best and most advanced examples of animated book covers. They look like being shot with a moving camera that was changing its angle, but it’s not exactly what has happened. Designer Doogie Horner and photographer Jonathan Pushnik took only two photos of each character: “before” and “after”. Next, Ron Fladwood used an image editing software to turn these two shots into a sequence of 12 images, adding movement and detail to the transformation. ⇢ Credits and more info. Animated cover of Doctor Sleep by Stephen King. This subtly animated cover was a part of pre-launch promotion for the sequel of The Shining. The cover was revealed in late April 2013 and featured the cat, Oscar, which was King’s early inspiration for The Shining. The cat could predict the deaths of terminally ill patients by sitting on their beds. The animation was a first step to draw attention to the cover design of the UK edition. The layout soon became interactive – here is a live example (mouse over the image to reveal interactive elements). A cover of Mr Mercedes. The new novel by Stephen King is coming out in June 2014. Again, its animated version is a part of the book cover release. The book is being published by Hodder & Stoughton, and this publisher is one of the first ones to include animated covers to a collection of book marketing tools. Another example follows. The Three by Sarah Lotz. A simple yet intriguing animation very well describes a new thriller for fans of The Shining Girls, The Passage and Lost. It’s one of the most stylish animated book covers so far. ⇢ Credits and more info. Animated YA book covers. The designers from Epic Reads, a one-stop destination for teen literature of all kinds, spent long hours (and had a lot of fun) to bring movement to the original artwork of selected books. Bristol Short Story Prize Anthology Vol 7. Most of animated book covers available on the web are made for science-fiction, fantasy, or mystery novels – and therefore have the style common for these genres. 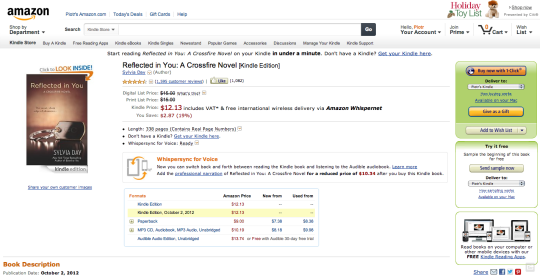 The example above shows that animation is relevant for every book category. The cover was created by a Bristol-based illustrator Harry McKenzie, and was an entry to a Bristol Short Story competition. The Strange Case of Dr Jekyll and Mr Hyde. A classic novella by Robert Louis Stevenson is reimagined by an artist and cover designer Mina Bach. I’m not sure about the colors and typography, but the idea of the animation is excellent. ⇢ Credits. The Devil Inside the Beltway by Michael J. Daugherty. The cover is an example of animation successfully applied to a non-fiction book. With a topic like this you don’t need more than the eyes that are watching you. When you visit the author’s webpage, you’ll see the animation in action, as it’s placed in the sidebar together with a static version. Which one grabs your attention? Animated cover of The Book of Life by Deborah Harkness. As a part of teaser promotion, the animated cover of the third book from a bestselling All Souls trilogy was revealed. What could be more relevant for a book entitled The Book of Life? Chitty Chitty Bang Bang Flies Again by Frank Cottrell Boyce. It’s quite obvious children’s books are naturally born for animated covers. Above you see one of the earliest examples of animated book covers. It was designed in 2011 by Macmillan Children’s Books fiction art director, Rachel Vale. In a press release the creator said: “The possibilities in animating existing print covers are endless, and we are only at the beginning of a very, very exciting journey.” ⇢ More info. An animated version of a book cover of Taipei by Tao Lin. Here is another example of using animation in pre-launch book marketing. The cover was designed by Cardon Webb and was widely discussed on the web.⇢ More info. Alternative, animated comic book covers. These covers, designed by ABVH, take advantage of the digital context. Why should the cover has the title and any other text, if all these elements can be placed next to it? Plus, the style has a great cinematic feel, bringing a new dimension to the comic stylistics. Alternative, animated covers of the Harry Potter books. This is one of the finest examples of fan art. These minimalist animated covers, designed by Jessica “Jeca” Martinez, illustrate in motion each of the Harry Potter books. Once published they became extremely popular on the web, drawing a lot of attention to the potential animation could bring to book cover design. The fact you started to read ebooks doesn’t mean the bookshelf with print books has to be abandoned. And Evernote can fix the biggest problem: where have I left this book? The bigger the library the bigger the problem, right? With Evernote you can make snapshots of books standing in your bookshelf. Book spines are fine, too, not only front covers. Evernote offers something called OCR, which stands for Optical Character Recognition. Thanks to that, a text in every snapshot in your Evernote account can be searched – book titles and book authors as well. The pictures have to be sharp, and that means taking the snapshot of the entire bookcase doesn’t help. But taking a close-up is what actually helps a lot. Let’s say you made 10 pictures that cover the entire bookcase. When Evernote finds the image with the book you’re looking for, you’ll also locate the part of the bookshelf where the book is standing. Simple as that. Let’s say you are in a library, working with a book, and want to make some notes. You can write down passages of text. You can also take a picture with your smartphone’s camera. But you can also take a picture with Evernote app. Evernote mobile apps offer a powerful photo-capture feature. You can take a snapshot of the visiting card or a page of the book. Photo capture is optimized to get the text clear and crisp. you can further makes the images editable. Evernote doesn’t offer scan-to-text functionality (yet), but you can use, for instance, Prizmo, a powerful application for Mac and iOS, which relies on a highly accurate OCR, and can export images to Evernote in pdf or text format. Here is an example. 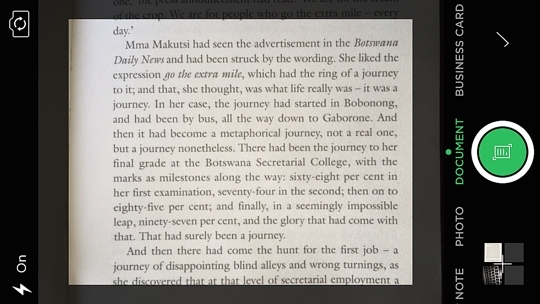 Using Evernote on the iPhone, I took a snapshot of page 95 from The Good Husband of Zebra Drive by Alexander McCall Smith. Once the snapshot is saved in a mobile app, it is automatically synced to all other instance of the user’s account. Tip: you can place a small post-it note in the margin next to the text that grabbed your attention. Thanks to that, when going through snapshots in Evernote, you’ll easily spot the selected passages. 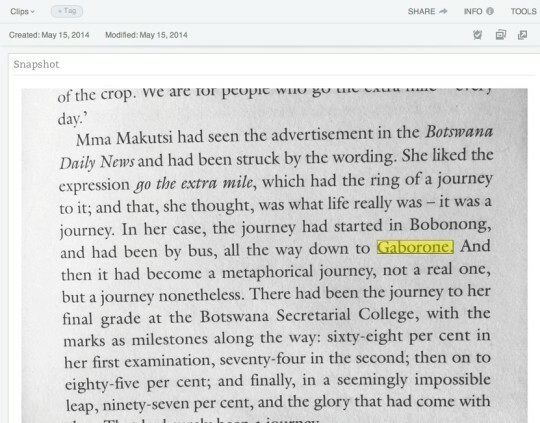 Every book-reading app offers the ability to highlight a text. However, if you want to make the text editable, and available from outside the app, for instance if you’re researching, you may want to pass the highlighted text to Evernote. 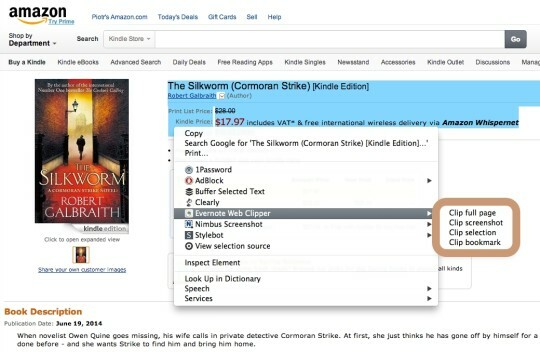 This tip works with any book-reading application that has sharing by email enabled. On iOS it’s Marvin app, on Android – Moon+ Reader, to name the few. To automate the work, you can use an IFTTT recipe I’ve just created, that does one thing: collects text sent by email, and tagged with a special word, in a single document on Evernote. the notebook - it’s set to default. Now, when you find the text you want to collect, select it and use “share via email” function. 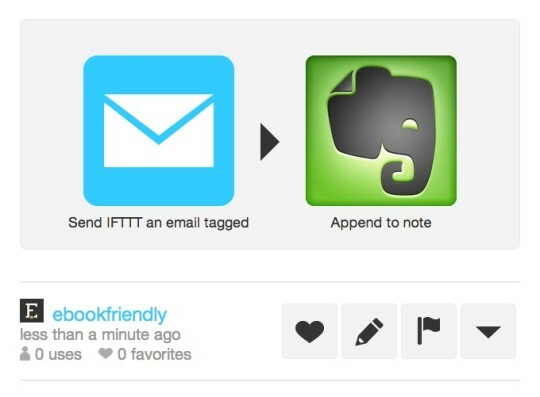 Send the email to trigger@ifttt.com, and add this special word IFTTT needs to properly execute the recipe. In our case it’s #highlights. You can add the tag either to the title or body of the email. It won’t be passed to the Evernote, anyway. The outcome will be a bulleted list of all texts sent via email from your book-reading application. You can obviously use this recipe to collect not only book highlights but any text, for instance, ideas, or clippings from webpages. Use the recipe as many times as you want, just choose a different tag for a different destination document in Evernote. Some online stores, like Amazon, offer an add-to-wishlist functionality, some don’t. If you want to collect all items you wish to buy, Evernote serves the purpose better than you think. When you download Evernote Web Clipper browser extension, adding items found on the web becomes extremely easy. Simply, use the context menu (right-click on PC, Crtl+click on Mac). You can clip entire page, screenshot, bookmark (url address) or a selection. I recommend that you select the section of the book page with the title, author, and information about the price (click or tap to enlarge). 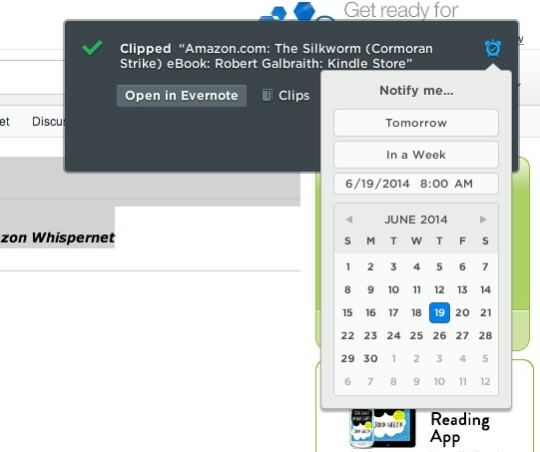 Then select Evernote Web Clipper, and Clip selection. The greatest thing about Evernote is the many possibilities it gives to manage the collected content. You can organize the items into notebooks, add the most important ones to shortcuts, mark with tags to easily find them, or see a history and add reminders to each note. 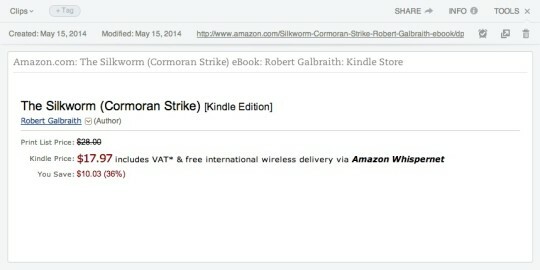 Reminders become very useful when you add a title that has not been released yet, like the second book from Cormoran Strike series by Robert Galbraith-Rowling. When you clip the selection to Evernote, click on an icon of the clock in the top right corner of Evernote Web Clipper widget. Then, in the calendar pop-up, mark the date when the book will be launched. Good question, but having in mind that prices of the bestsellers usually go down over time, it’s good to wait for a couple of weeks to hunt for a price drop. Tracking the price is actually another use for Evernote. As I wrote before, Evernote keeps the history of each note. You can come back to the note, check out the price on Amazon, and if it’s still too high, add a line of text to the note with the current price, and set reminder for the next time. If you don’t want to miss any book that made it to the very top of the The New York Times book bestsellers, you can use an IFTTT recipe created by sloanesturz. 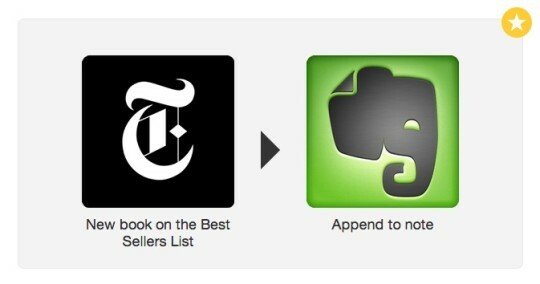 The recipe, one of the most popular using Evernote as an action, appends any new title entering the NYT bestseller list to a single note in Evernote. All you have to do is to activate the NYT channel on IFTTT (you don’t need to have the NYT registration for that), and select a bestseller list you want to track. Use the IFTTT recipe: Make a list of new books for your Kindle. Reading books is all about being focused. Online bookstore don’t help it, though. On Amazon, on a single page with book details, there are over 200 links (means “distractions”). 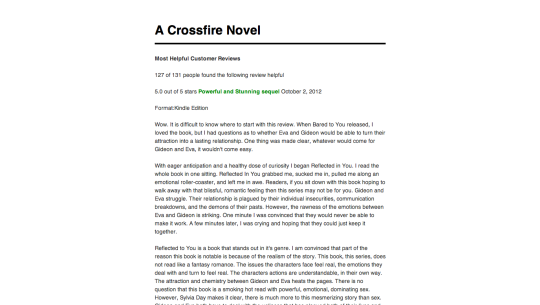 Very often, you have to scroll down to reveal book blurb, not mentioning reviews. It’s where Evernote Clearly comes handy. Clearly is a simple distraction-removing browser extension for Chrome and Firefox. When you use it on a webpage, it removes all the extra elements, like banners, widgets, buttons, etc. You’re staying with a clean and nicely formatted text. Finally something you can focus on!